Booo cardio. You hate it. Admit it. A lot of people think cardio is the key to getting lean. And most people would agree that lifting weights puts on the muscle, while cardio burns the fat. And that both must be done in order to achieve the physique you want. But, by definition, cardio is anything that raises your heart rate for an extended period of time. We hear cardio and think of the traditional means, like trudging for hours on the treadmill or elliptical, but really, with that definition, cardio can be anything. Like - your favorite thing - lifting weights! Strength training workouts, primarily due to rest intervals and their slower pace, don't sustain an elevated heart rate. They can, though, if you set them up right. High-load circuit training is going to be your way to get lean without doing traditional cardio. High load circuits are lots of sets, with heavy weight and short rest intervals. This combo of techniques allows you to gain muscle and burn fat at the same time eliminating the need for a separate bout of traditional cardio. Muscle is gained by increasing your testosterone levels. Testosterone is produced during high volume lifting, making these workouts tops of packing on lean muscle. 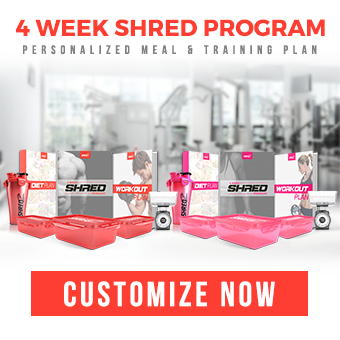 The heavy loads and short rest intervals will skyrocket your heart rate, creating a more effective calorie burn than steady state cardio and the more lean muscle, the higher your resting metabolism, turning you into a fat burning machine 24 hours a day. Your high load circuits should include multi-joint exercises that use the most muscle mass to increase testosterone levels and burn maximum calories. Choose 5-8 simple, full body exercises that require little technique, as you will fatigue quickly and don't want your form to be compromised (ex. deadlifts on the cable machine instead of with a barbell). Be conservative in your weights, opting for around 75% of your max. Work high load circuits into your regular routine once or twice a week along with your traditional weight lifting sessions. Here’s an example of a fat-blasting routine you can do in place of cardio machines. Complete 1 set of 6 reps of each exercise. Repeat the circuit 5 times. Push as hard as you can throughout, resting no more than 30 seconds between exercises. To perform a burpee, start by standing and drop into a squat position on the ground. Kick both feet back while keeping your arms extended, palms on the floor. Touch your chest to the floor, push back up, and immediately return your feet to the squat position, and then from there, explosively jump up from the squat, reaching your arms above you. Burpees target mainly your pectoralis major (chest), quadriceps (front of thigh), gastrocnemius (calf muscle), and hamstrings (back of thigh). 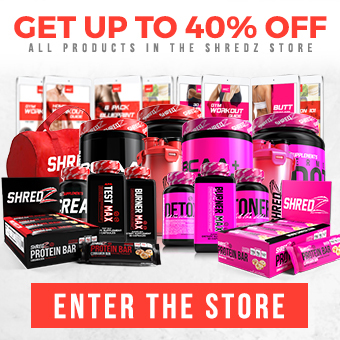 Click HERE to watch SHREDZ athlete Nikki Leonard perform the perfect burpee. Standing in front of a bench, hold a plate out in front of you with both hands, arms fully extended. Lift one leg up about 45 degrees off the ground. Lower yourself until your glutes hit the bench, and stand back up on the one leg. After your set, repeat on the other side. This exercise targets primarily the glutes (rear) and hamstrings (back of thigh). Click HERE to watch SHREDZ athlete Brittany Coutu perform a pistol squat with and without a plate. To do a kettlebell swing the right way, hold the kettlebell by the horns, knees slightly bent. Squat with the kettlebell between your legs and slightly behind you. Push your hips and rear backwards to get a nice stretch on the hamstrings. Think of your hips as a pendulum, as you drive the kettlebell up with the force of your hips. Once the kettlebell reaches desired height (straight in front or overhead), return the bell between your legs and repeat. The kettlebell swing targets primarily the glutes (rear), but also the hamstrings (back of the thigh), rhomboids (upper back muscles), and deltoids (rounded part of the shoulder). Click HERE to watch SHREDZ athlete Nikki Leonard perform the perfect kettlebell swing with and without a full extension. 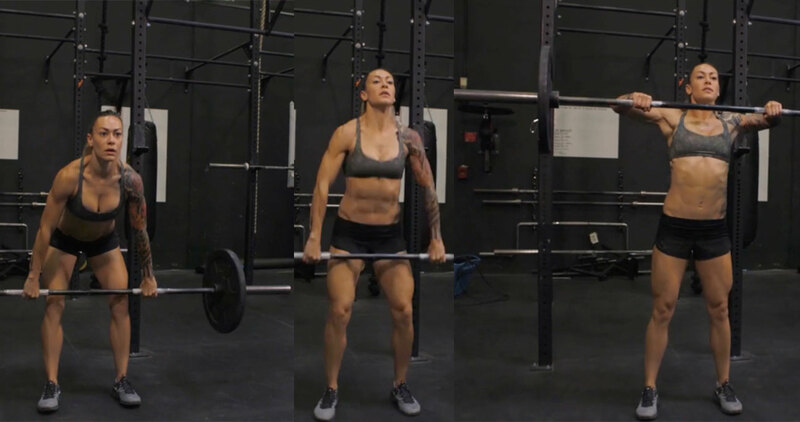 Stand holding the barbell, feet hip distance apart, hand placement on bar little bit wider than shoulder width. From the hang position, bend your knees, push your hips back, and lower the bar to just above the knees. Then, explosively, extend your hips and knees, tightening your core and glutes, while bending your elbows outward and pulling the bar to chest level, squeezing your shoulder blades together. Return the bar to the hang position and repeat. This exercise activates the trapezius (between back of neck and back of shoulder), glutes (rear), and posterior deltoids (side of the back, just under the shoulder and behind the arm pit). Click HERE to watch SHREDZ athlete Nikki Leonard perform high pulls with and without a full extension. Start in a lunge position, weight on the front foot. Hold a medicine ball down by your back knee, torso twisted. In one motion, with arms straight, raise the ball up to the right in a diagonal sweeping motion. Then return to the starting position doing the motion in the opposite direction. As you move, keep your back and arms straight and your core tight while twisting your torso. Be sure to pivot your back foot as you raise your arms up. This exercise targets mainly the obliques (side abdominals). We love this exercise because it gets your heart rate crazy without having to step on a machine. In fact, you don’t need to move your legs off the ground, but it gives your arms as well as your legs a fantastic workout, and it’s fun to do! Grab the ropes at your sides, raise them in front of you, and slam them to your left side. Pull up quickly using your shoulders and swing the ropes high in front of you and down hard on your right side. Repeat the movement back and forth. To protect your back, be sure to bend at the knees and keep your back straight and your chest forward. This exercise targets a boatload of areas, but primarily the glutes, biceps, delts, and lats. Click HERE to watch SHREDZ athlete Brittany Coutu perform battle rope side slams.